My long-anticipated trip to Yarn School is nearly upon me! A week from today, it’ll be underway. 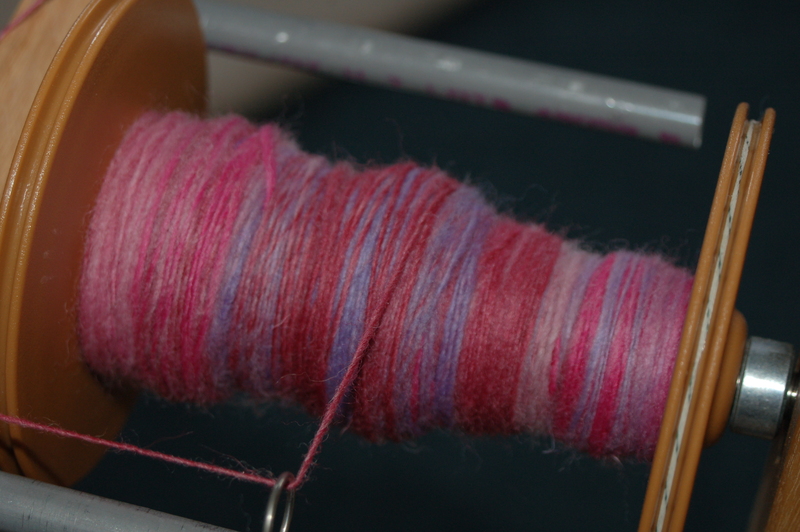 I’m tremendously excited to expand my spinning skills and get some hands-on experience with dyeing fiber — not to mention simply some intensive time working in these crafts and hanging out with others who enjoy them! The fact that I haven’t touched my spinning wheel in months now. I hope to at least finish spinning the 4-ounces currently on my wheel, which is hopefully enough to get me reacquainted with it and spinning generally. I’m a novice, but I don’t want to go in completely unaccustomed to the feel of fiber turning into yarn in my hands. The fact that we moved into our new house less than a week ago, and we still don’t have all of our stuff here, let alone all in its proper place. This certainly makes it harder for me to get my hands on my wheel, to say the least — my spinning wheel is one of those things that’s still at the old place. I took this photo in early September 2009. I have added quite a bit of bulk to this bobbin since then, but alas. This is spun from hand-painted wool roving. I haven’t decided yet how want to ply it. So, making some progress on this (and on getting moved in, and the unending list of projects that crop up after moving) is on tap for this weekend (or at least this coming week). What about you? This entry was posted in knitting, spinning, WordLily and tagged yarn school. Bookmark the permalink. How exciting! I have a wheel (Ashford Traditional) but I rarely spin. I much prefer to knit. Can’t wait to hear all about your knitting/spinning adventures.